At Pawn Big Palmdale , we buy all kinds of gold. If you have any item that has gold in it – whatever the item may be – you can easily turn it into cash within minutes at Pawn Big Palmdale . What are you waiting for? 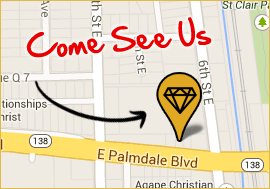 Bring your gold items to Pawn Big Palmdale today! We said it once and we’ll say it again – we’ll take any gold items you have and give you top dollar for them. You won’t get a better price for your gold items anywhere else. Gold prices are currently hovering around record highs, so there’s no better time to get the best price ever for all your gold items. Let us make you an offer that you simply can’t believe! Whatever you sell to us will be paid for in cash, and we’re prepared to give you hundreds or perhaps even thousands of dollars on the spot. Got gold coins? Not sure what your coins are made of? Just bring them to Pawn Big Palmdale for an expert evaluation by one of our experienced appraisers. We accept gold coins from any country and time period, so don’t hesitate to turn your gold coins into cash at Pawn Big Palmdale today. It doesn’t matter if the clasp is broken or the precious gem has fallen out – if it’s made of gold, it’s definitely still valuable! Bring all your gold jewelry, including rings, bracelets, necklaces, etc.) to Pawn Big Palmdale and you’ll get a high price for it that’s based on its objective value. 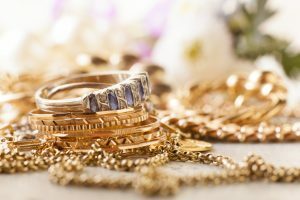 We’ll evaluate your items’ value based on the value of the gold, regardless of age or condition. We’re ready to pay you top dollar for all your gold jewelry. Got a gold tooth that you don’t need any more? Turn it into something you can definitely use – cold hard cash – at Pawn Big Palmdale today. You’ll be so glad you did! Sure, the gold rush has been over for a long time, but plenty of people still have gold dust. Maybe you inherited it from a grandparent or another loved one. Don’t just leave it sitting around in a drawer, totally useless – pay some bills or take your family out to eat with the money you receive from Pawn Big Palmdale . Get the best price for your gold watches at Pawn Big Palmdale . We’re a reputable company that employs expert appraisers who are totally familiar with the value of many kinds of high-end watches from brands like Rolex. Let us give you an offer you simply can’t refuse for your gold watch. We buy many other items, too! Our store is located at 557 East Palmdale Blvd. Palmdale, CA 93550 and business hours are Mon-Fri 10AM-6PM. Stop by today!